Huong Hai understands customers’ desire and we built the first traditional style wooden boat with deluxe cabins and facilities. As a result, nearly half of 1 million people have joined Huong Hai Halong Cruises on magical, enlightening journeys through Halong Bay. As a result, a new luxury steel-made cruise named Sealife Legend Cruise is born. 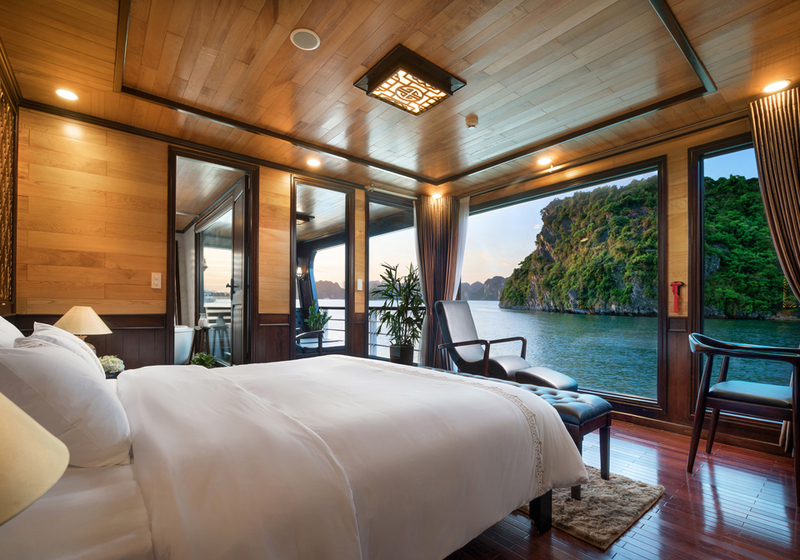 The new boat inherits the experience of cruise service over the years and set a new standard of luxury cruise in Halong bay. 12:00: Welcome on board – Sealife Group Lounge – Got pier – Hai Phong Province. Welcome on board at our luxury Sealife Group Louge with welcome drink before having short transfer to the Sealife Legend Cruises – the Legend of the Sea. 12:30: Embark on Sealife Legend Cruises Once you have been transferred to Sealife given a short briefing about your cruise Restaurant. Lunch will be served at Fish Net Restaurant while Sealife Legend Cruises goes to Lan Ha Bay by passing Halong Bay. You will pass the majestic limestones rising from the emerald sea water of Lan Ha Bay. Van Ta Area is inclusive of Dark and Bright Cave, border of Halong Bay and Lan Ha Bay, and it is one of the less visited and most intriguing caves in Halong and Lan Ha Bay. 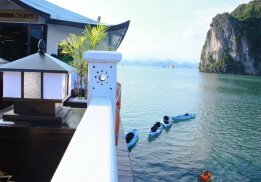 And Sealife Legend Cruises invite you to visit Bright Cave by bamboo boat rowed by local people through some floating houses where they are feeding fishes, clams and oysters. After rowing boat trip, you have chance to kayak or swimming in the green emerald and cool water (subject to weather, allowance and season) before cruising to the boat to cruise to sleeping area. Shortly cruising to sleeping area for rejuvenating your mind body and soul with our open Jacuzzi, sauna, gymnasium and massage* on thethird deck (*massage will be charge as your wish). After your rejuvenation time, you are welcomed to our cooking demonstration with Vietnamese traditional liquor tasting on the sundeck to learn about traditional cuisines made by fishmen.You will try your hands at making “Ca Thinh” – fermented fish – using traditional vinegar made from distiller’s grains, rice powder, herbs and rice paper. Then cheer up with a Vietnamese traditional liquor tasting. Drinking and having fun in the local style could be a highlight of your day. 20:30: Live Pilipino band at Navy Club or Squid Fishing. 22:30: Free of mind with sweet dream. Return to your cabin for very sweet dream or relax on our sundeck for cup of beer with your beloved on Sealife Legend Cruises. 09:30: Check out cabin | Buffet Brunch at Fish Net Restaurant. We return to the quay side to disembark and check out the cruise and return to Hanoi. Notes: Cruise itineraries and schedules are subject to change without prenotice depending of the weather and operating conditions. All meals on board as mentioned. Starting a new day with Vovinam class – Vietnam martial art or watch the sunrise on the top deck to feel the freshness of the life with a cup of tea or coffee. Breakfast is served in the Fish Net Restaurant. We transfer to speed boat for visiting Cat Ba World Biosphere Reserve with Viet Hai ancient village. You will take the bicycle trip along the village, admiring stunning scenery of lagoon, forest, rice fields on the way. Then you will have sometimes for trekking into the forest and explore the ancient house. You will have lunch at homestay located in Viet Hai village with a meal in authentic Vietnamese style. 14:30: Hollywood blockbuster- Kong: Skull island. After your lunch, we bike return to the pier for short cruise to Hollywood blockbuster- Kong: Skull island filming which is untouched and protected area of Lan Ha Bay, which appears in the Hollywood blockbuster- Kong: Skull island and enjoy the magical beauty of the bay to understand why this area was shooted in this film. Time for swimming and relaxing at untouched beach in Lan Ha Bay. Shortly cruising to sleeping area for rejuvenating your mind body and soul with our open Jacuzzi, sauna, gymnasium and massage* on the third deck (*massage will be charge as your wish). You are invited to experience the art of Vietnamese traditional tea tasting in the Dragon Legend Restaurant on the third Deck to understand the art of Vietnam tea history. 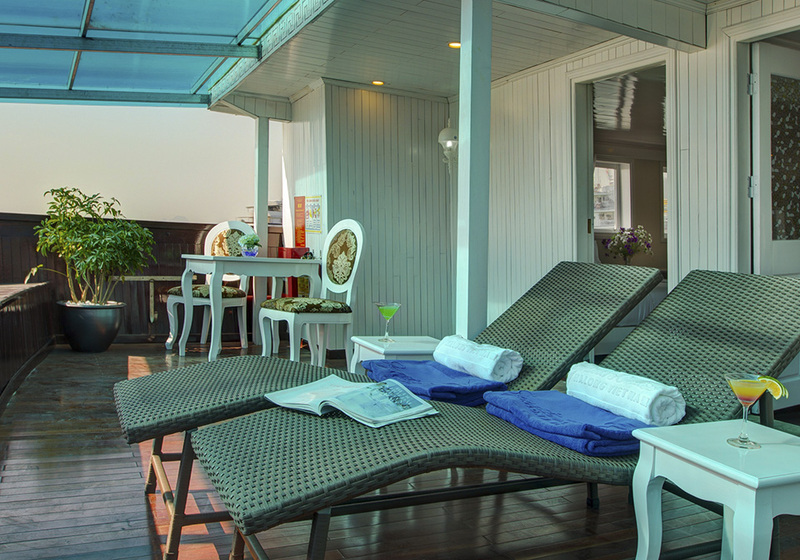 There are 2 bars on Huong Hai Sealife Cruise: One on the first floor and another on the Sundeck. With the roomy & atmospheric dining room, Huong Hai Sealife Sea Flora Restaurant provides customers with the perfect dining experience. Our seasonal menus use the best fresh local ingredients. The atmosphere is intimate and the service is always attentive and customer-centric. The Sea Flora Restaurant includes a bar where the customer can enjoy cocktails and wine. 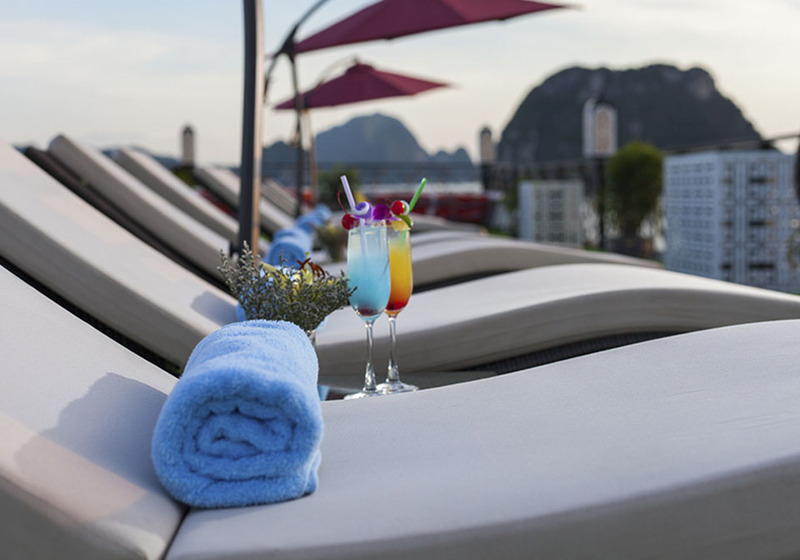 You will be charmed by the restaurant and appreciate the warm ambiance and taste the delicious cuisines accompanied by stunning views over the beauty of Halong Bay and Bai Tu Long Bay.